I live my life on the internet. Obviously, I work here. But I also find my entertainment here. Along with going to dozens of gaming websites every day, I also stop by several webcomics, one of which is Looking For Group. I just love reading about the wacky antics of Cale, Richard, and the rest of the group. Who doesn't love a good "Fwooosh!"? Speaking of things being on fire, "sometimes you just gotta burn down an orphanage." Well, that's the case in Orphans and Ashes, anyway, a new game set in the Looking for Group universe. 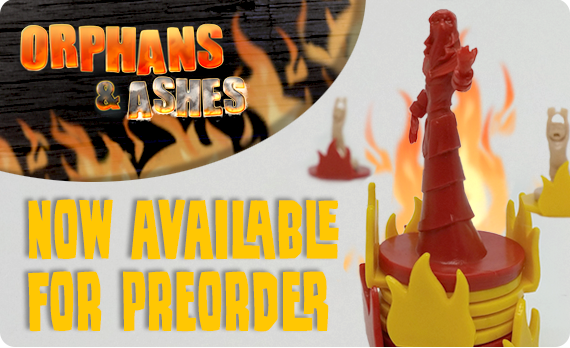 Pre-orders are being taken now. In the game, it's a race between Cale and Richard. Cale, of course, is looking to save as many orphans from the raging inferno as he can. Richard... uh... not so much. As anyone who has read the comic knows, he's much more interested in spreading the fire and burning up some orphans. The game is a 2-player tile-laying game (with some push-your-luck elements thrown in as well). People who pre-order the game will also get a special soundscapes set from Syrinscape. 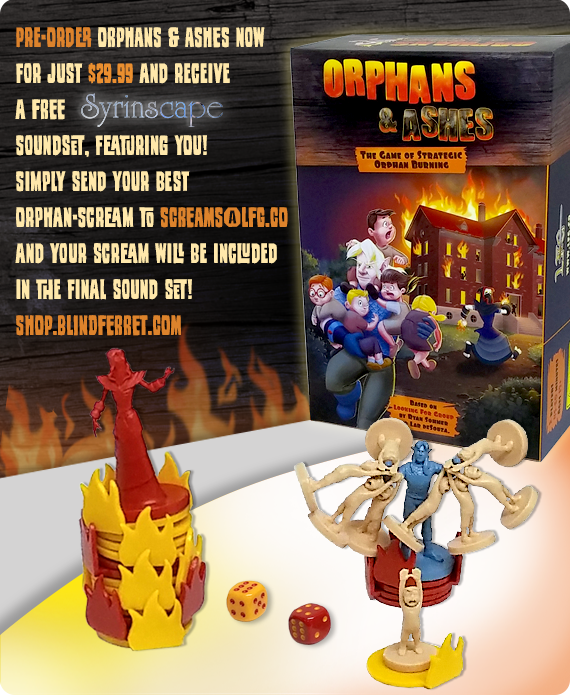 Because if you're going to have a game about fire and screaming orphans, you might as well get the full effect going with being able to hear the roar of the fire and the screams of the dying orphans.